Those who live in the Hockinson area enjoy wide open spaces and a little more elbow room than can be found in areas closer to Vancouver. Located northeast of Vancouver and just south of Battle Ground, the Hockinson school district has an elementary, middle and high school. Available homes in the Hockinson area are usually situated on larger lots than those found closer to Vancouver. Several homes are in the million dollar range and the average home value is around $430,000. Several lots are also available for less, allowing you to build your dream home. There are several areas to get out and enjoy the outdoors. 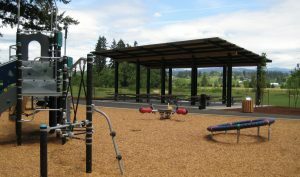 Hockinson Meadows Community Park is a 240-acre park with several baseball and soccer fields, a covered picnic area, an off-leash dog area, picnic tables, drinking fountains restrooms and over 400 parking spots. Named after a Clark County Sheriff Office dog that was killed in the line of duty, The Kane Memorial Dog Park is 2.5 miles of mostly flat terrain. There are two other parks for outdoor recreation nearby as well: Lewisville Regional Park and Battle Ground Lake State Park. The east fork of the Lewis River travels through Lewisville Park and is a great place to cool off during the warmer months. There is also a boat launch, play equipment and picnic areas. Battle Ground Lake features equestrian trails, hiking and biking, fishing, swimming, and kitchen areas. Located just north of the Hockinson area, the lake is another place to enjoy the water during the summer.